Store to Door proudly received this year’s Oregon Governor’s Volunteer Award for Outstanding Nonprofit Volunteer Program in Multnomah, Washington and Clackamas Counties. 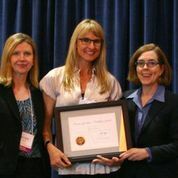 Executive Director Kiersten Ware and Board Member Michelle Carew accepted the award from Secretary of State Kate Brown at a ceremony in Salem, Oregon on April 24, 2014. Store to Door supports independent living for Portland area seniors and people with disabilities by providing a low-cost grocery shopping and delivery service. 100% of Store to Door’s clients are low-income or unemployed and 80% are women. With the help of 275 volunteers who take orders, shop, and make deliveries every week, the agency serves 400 low-income people in Multnomah and Washington Counties every year. Store to Door provides access to fresh food, medications, and household items and is the only service of its kind in Oregon. “It was an absolute honor to receive this award on behalf of the hundreds of dedicated Store to Door volunteers who help make independent living and aging with dignity possible for our clients,” said Kiersten Ware. The Oregon Volunteers Commission for Voluntary Action and Service organizes the awards program. Wells Fargo sponsors the awards and is making a cash grant to each nonprofit organization being recognized. “The honorees’ dedication to volunteerism has helped create stronger, more vibrant Oregon communities,” said Wells Fargo Regional President Tracy Curtis. Store to Door’s services in the Portland metro area are vital for the growing population of seniors. For seniors, protecting themselves from food insecurity and hunger is more difficult than for the general population. One in six seniors will experience hunger. Congratulations to everyone who currently volunteers with us or who has supported our work at anytime over the last 25 years! 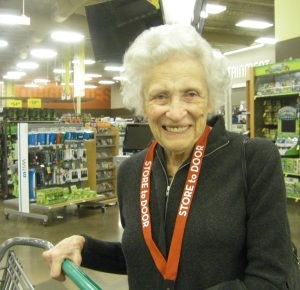 Meet Jean Pierce…a weekly (and usually twice weekly) volunteer grocery shopper for Store to Door for more than 20 years. Jean will turn 89 years old in June 2014. Jean is a life-long volunteer. She grew up with the mindset that everyone should give back in whatever way they can and she’s volunteered for as long as she can remember. Among many other things, she volunteered for the Citizens Review Board through the Oregon Judicial Department for nearly 20 years, helping to review cases involving foster children and foster care issues. She spent many years contributing time to CASA in Portland, which also advocates for children in the foster care system. Jean’s also volunteered at nearby juvenile homes, thrift stores and run errands with and for local foster children throughout the years. Her dedication to shopping for Store to Door every week is part of what makes our volunteer-reliant program work. She knows how the program works and is committed to the cause. Add up all of the hours Jean has volunteered with Store to Door over the years, and you’re looking at between 3,000 to 4,000 hours! “I tell everyone I know about Store to Door,“ she says. Jean enthusiastically spreads the word about Store to Door, distributing program brochures wherever she can because she strongly believes that there’s a great need for our services. And there is. Jean plans to continue volunteering regularly with Store to Door for as long as she’s able and, believe it or not, she’s even actively looking to find an additional volunteer opportunity to enjoy in her spare time. As we celebrate April’s Volunteer Appreciation Month, we can’t thank Jean and all Store to Door volunteers enough for their enduring commitment to such an important cause. You make Store to Door possible. To become a Store to Door volunteer, please contact Barb McDowell at Barb@StoretoDoorofOregon.org or call 503-200-3333 ext. 008. 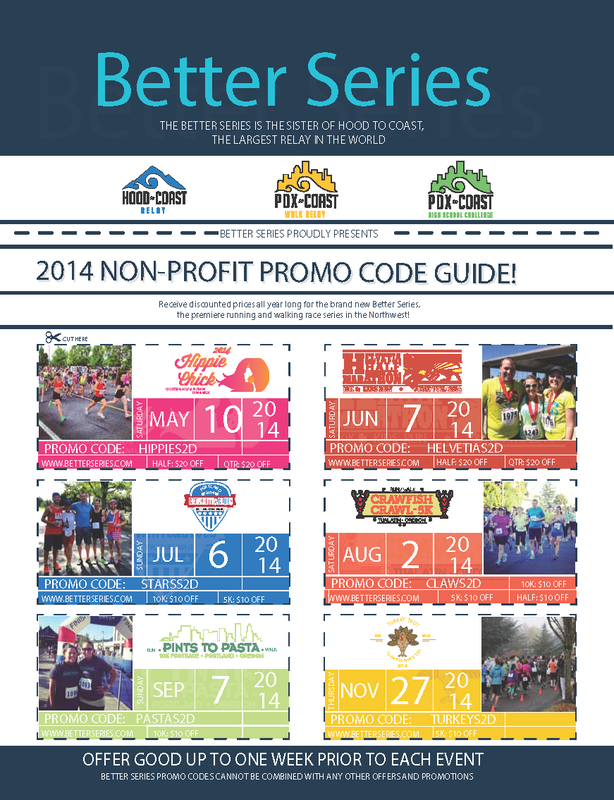 10% of the day’s sales to our volunteer-based program. It’s a great excuse for a night out or lunch date with friends and family!